Genetic calculator to aid in designing breeding strategies. Is there a better alternative to GeneMixer? Is GeneMixer really the best app in Science category? Will GeneMixer work good on macOS 10.13.4? GeneMixer calculates genotypes of progeny and associated probabilities from parent genotypes using Mendelian genetics. Useful to quickly design breeding strategies. Replaces Punnett squares with up to 4 traits (tetrahybrid cross). 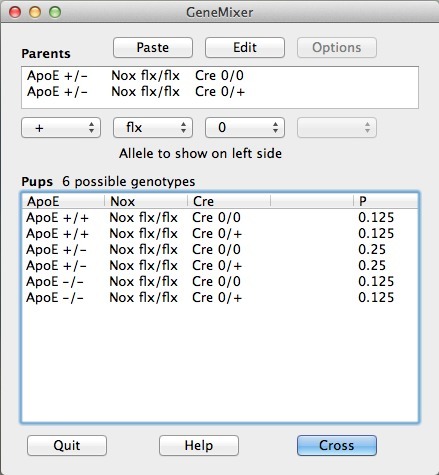 Parent genotypes can be edited or pasted from a spreadsheet/text editor. Results are copied to the clipboard and ready to paste right back into the original spreadsheet. GeneMixer needs a review. Be the first to review this app and get the discussion started! GeneMixer needs a rating. Be the first to rate this app and get the discussion started!